Italy is a country that's as varied as the palettes of its great Renaissance artists, awash with color and culture. Lose yourself in the green rolling hills of Tuscany, bathed in the orange glow of the setting sun, and sip a succulent limoncello while taking in the sapphire surf of the sea. Marvel at the fantastical cream-colored figures of the Trevi Fountain, and relax at a neighborhood trattoria with a ruby-red glass of the country's best Chianti. This isn't a place where you go to vacation ' this is a place where you go to live. For centuries, Italy has been one of the most popular destinations for discerning travelers: a fact that's undoubtedly linked to its rich history and cultural attractions. This is a country that saw the birth of the Renaissance and the spread of the Roman Empire; that has produced profound poets and legendary leaders; that boasts some of the most breathtaking scenery on Earth. It's home to some of the world's greatest cities ' Florence, Venice, Rome ' as well charming and bucolic towns and villages. Throw in a beloved cuisine and some of the friendliest people you could hope to meet, and it's no wonder that Italy continues to draw people in ' as it has for centuries. A relatively small country (it's less than half the size of Texas! ), Italy is so filled with cultural and natural treasures that UNESCO conferred it with 49 World Heritage Sites' more than any other country in the world. Italy's famed and cosmopolitan capital, Rome remains one of the great European cities more than two thousand years after its founding. The Roman Forum is a stirring sight, as are the fabulous marble fountains and elegant piazzas that symbolize the more modern sections of this stylish city. Vatican City is the world's smallest sovereign state and home to some of the greatest art and architecture in the Western world. The residence of the Pope and the center of Roman Catholicism, its legendary attractions are sure to leave you breathless ' from St. Peter's Basilicag to the incredible Sistine Chapel. There is truly nowhere on Earth quite like Venice, the fabled 'Floating City' that has enchanted visitors of all stripes for centuries. Here, you can shop for fine glass and handmade lace on the Rialto Bridge, sip a refreshing Bellini at Harry's Bar, and enjoy the sunset over the Adriatic from a cafe on the banks of the Grand Canal.
' but history buffs, gourmands and shopaholics will also relish this spectacular city on the banks of the River Arno. Milan is the second-largest city in Italy and the home of some of the most celebrated fashion designers and haute-couture houses in the world. It's a vibrant city of fine living and high culture, from the glittering boutiques of Via Montenapoleone to the hallowed halls of La Scala' one of the world's most renowned opera houses. Take a tour through the seven miles of galleries that make up the Vatican Museums, as an erudite guide introduces you to some of the greatest artworks in human history. You'll be regaled with stories as you feast your eyes upon the stunning frescoes of Raphael, the sublime watercolors of Titian, and to cap it off, the inimitable beauty of the awe-inspiring Sistine Chapel. Explore the sun-dappled vineyards and medieval hill towns of Tuscany, one of the country's most diverse and evocative regions. You'll marvel at some of the world's most venerated architecture: from the stately villas of Palladio (the West's greatest architect) to the iconic tilt of the Leaning Tower of Pisa; from the soaring Duomo in Florence to the graceful Campo in Siena. Immerse yourself in Italy's centuries-old culinary heritage in Bologna, the gastronomic heart of the country, as you learn all the tricks of the trade in a true Italian kitchen. You'll make pasta, antipasto, main dishes, and classic desserts ' then sit down to enjoy them at a family table with a fine glass of local wine or one of the succulent national liqueurs, like Amaretto DiSaronno from Lombardy or Campari from Milan. Explore Venice in timeless fashion as a charismatic gondolier captains you through the city's labyrinthine canals in a sleek, jet-black gondola. Whether cruising by grand piazzas and famous landmarks, or through some of the quieter Venetian neighborhoods, this is an incurably romantic experience that is sure to leave indelible memories. Discover Milan's most glamorous fashion boutiques (and most attractive bargains) on an exclusive guided tour with a 'personal shopper'. From the magnificent Galleria Vittorio Emanuele II, one of the world's oldest shopping malls, to the dazzling Quadrilatero della Moda, the fashionistas among you might just think they've died and gone to Heaven. Spend a day in majestic Naples, where the largest historic city center in Europe lies under the daunting shadow of soaring Mount Vesuvius. Take a guided tour of the UNESCO World Heritage Sites on the city's outskirts, from the opulent Palace of Caserta to the haunting ruins of Pompeii and Herculaneum ' both buried by Vesuvius in the devastating eruption of 79 AD. Gourmands should make time to try an authentic Neapolitan pizza at one of the many little pizzerias overlooking the Gulf of Naples ' where the world's most famous flatbread was first made. Sportsmen and outdoor enthusiasts simply can't miss the north of Italy, where the Southern Alps gradually give way to the roiling waves of the Mediterranean Sea. In winter, the skiing here is among the best in Europe, and the scenic stretch of the Italian Riviera ' including the enchanting villages of Cinque Terre ' is truly awe-inspiring. It's also the home of Italy's lake district, where visitors will find some of the most elegant and romantic resort towns in the world: places like Como, Bellagio, Ravenna, and Cannobio. The climate throughout Italy varies by regions and seasons. The northern part of the country generally experiences longer, colder winters and more mild (but more humid) summers than the south. For instance, in a northern city like Milan, the temperature can get down to the 20s during December and January.'? A southern city, like Palermo, can experience 90s in the months of July and August. The central regions of Italy ' Tuscany, Umbria and Lazio, for instance ' commonly have the best weather regardless of the season: you'll be spared the heat of the south and the greater likelihood of rain in the north. 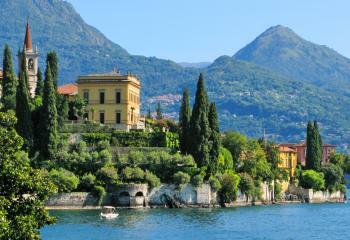 The peak travel seasons in Italy are late spring to early summer, and early autumn. Normally, many prominent attractions will be busiest in May and June, so the best time to go to the best-known destinations ' Florence, Venice, and Rome ' is either in April or in October. However, smaller towns and more rural areas are generally less crowded even in the height of the season, which makes for a nice option in those months when the major cities are packed with tourists from around the world. Nothing in the world can compare to being in Rome, Venice, Florence, Cinque Terra, and the Amalfi Coast in the early summer months: the weather is sublime, the scenery is at its most breathtaking, and the locals are ebullient and gregarious in their celebration of their magnificent country. Of course, to experience Italy at its absolute best, you should make your reservations far in advance if you plan on visiting Italy in the midst of the high season. By reserving early, you will have more options and availability with accommodations and activities. Traditionally, most of Italy takes off the entire month of August when the locals flee the oppressive heat for the cooler temperatures of seaside or mountain resorts. If you choose to visit in August ' even in the biggest cities ' expect fewer places to be open, and with less frequency. Some restaurants might only serve lunch, for example, or not open until the evening after the weather has cooled. However, the late summer and early fall months are perfect for visits to the Italian countryside, especially for gourmands'it's during the harvest season for many of Italy's wine regions, and it's absolutely the best time to enjoy truffles in Piedmont and other northern Italian regions. There are a number of great places to visit in Italy during the winter. Skiing is excellent in the north ' the Dolomites and Alpine regions. Southern Italy (regions like Puglia, Campania, Sicily and Calabria) is generally quite pleasant in the early and late parts of the year. It's not unusual for Milan, in the north, to see snow while Palermo, in the south, can be in the 70s on the same day. Early March can be rainy (Venice, Cinque Terre, etc.) but the biggest and well known cities start to clear up in late March or early April: this is the time to visit, before the influx of tourists come to experience the brilliant months of May and June. Christmastime brings a number of beautiful and unforgettable festivals and traditions throughout the country, though you'll find the weather in the southern and central regions usually less harsh than in the north. The winter months are also the best time to visit for budget-conscious travelers, allowing you the chance to engage with Italy's splendid cultural scene without the burden of large crowds. Nothing will heighten your Italian experience like the perfect hotel, and Italy has a huge range of accommodation that is as eclectic and exciting as the country itself. Families will revel in the condo-style hotels that can be found off the winding canals of Venice, or the charm of a private villa deep in the hills of Tuscany. Couples will cherish the romance of a cliff-hugging suite near the Blue Grotto of Capri, and rave about that quaint hotel room right next to that incredible pizzeria and the sprawling Spanish Steps. Nor do the options stop there: you can step into the Renaissance splendor of a former castle, indulge in bubbly and room service at a posh Rome hotel, or charter a Orient-Travel motor-yacht to cruise along the Amalfi coast. There are also, of course, a number of international hotel chains with an extensive presence in Italy ' offering you all of the comforts and familiarities of home while you're an ocean away. Be advised that rooms in European hotels tend to be smaller than their American counterparts, and many older hotels in the country do not have elevators to the higher floors. When considering a particular type of hotel, it's wise to remember that room sizes in Italy tend to be smaller than those of an equivalent rated American hotel. Italy is a member of the European Union, so Americans don't usually need a visa or any other entry requirements unless you plan to work here or to stay longer than 90 days. Should you require a visa for either of these reasons, you can apply for one at the nearest Italian consulate: much of the process can be done over the phone, but you will need to visit a consulate in person before you receive your visa to travel. Being a member of the EU also ensures that Italy must meet international standards of hygiene and cleanliness, making it one of the safest countries in the world to visit. There is little risk of major disease, the water is safe to drink, food cooking and preparation standards are extremely high, and all hygiene facilities are modern and well-kept. Should an accident occur, Italian hospitals and the healthcare system are excellent: in 2000, Italy's healthcare system was rated the second best in the world ' behind only France ' by the World Health Organization. While much has been written about the pushiness of Italian men, this trait is essentially benign. Some single women suggest wearing a false wedding ring to discourage advances, but this is generally considered overkill: even the most dedicated flirters will back off if they feel their advances are unwelcome. In terms of general safety, almost every Italian city is as safe or safer at night than the average American city ' and even the 'more dangerous' cities like Naples are tamer than they are sometimes portrayed. The incidence of violent crime is much lower in Italy than in the US, and major city centers are almost always well-lit and patrolled by local law enforcement. As with any travel experience, it is wise to employ some basic discretion in your everyday practices. Keep your passport separate from your cash and credit cards (your hotel is almost always the best place to keep it), travel in groups, keep to well-lit streets and intersections, and try not to appear obviously lost or disoriented. The overwhelming majority of Italians are friendly, engaging people who will help you if asked, so never be afraid to ask for assistance if you need it. English is generally understood or spoken, and even people who can't speak English usually know where to find someone who can. Italy is a modern nation with contemporary sensibilities, but it is also a country with a strong conservative past. Shorts are more common now than they were even fifteen years ago, but everyday fashion is, generally speaking, slightly more formal in Italy than it is in the States. The most important considerations when it comes to Italian etiquette relate to churches and other places of worship: many of Italy's churches will ask that you cover at least your shoulders ' and often your upper legs as well ' before entering. There will usually be a sacristan at the door to inform you if you need to cover yourself further, and they'll generally offer a large piece of fabric to wrap around you while you're inside the church. Finally, while most Italians ' particularly in the service sector ' can speak English reasonably well, every Italian appreciates an effort to try to converse with them in their own language. Memorizing everyday words and phrases like 'hello', 'please' and 'thank you' (as well as the ever-important 'do you speak English'?) will not only make you easier to understand, but will also demonstrate a respect for Italy, its language and its people that natives are sure to appreciate. With this option, you have the best of both worlds and you'll enjoy a variety of unique and authentic experiences, customized for you. You'll travel independently, but your trip will be carefully planned for you to ensure hassle-free logistics, perfect hotel selections, and most importantly, authentic experiences that are most meaningful to you. For example, food lovers can have their trips designed around the foods of Italy or explore Tuscan cuisine in one of orient's Tuscany tours. If you're interested in discovering an eclectic world of Italy, our Sicily tours section offers a wide range of ideas. Or if you're into art and fast cars, or any unique combination of special interests, your trip can be designed accordingly. All you have to do is tell us about your dream trip by filling out a Trip Request. We'll then match you with 2 ' 3 Italy travel specialists who will work with you to customize a tour package'designed just for you.